DESCRIPTION -- Dating from the 1960's this is a silver-plated ashtray from the orient Line vessel the SS Oronsay. It shows in the centre the company houseflag and vessels name and is in a good condition. HISTORY -- SS Oronsay was the second Orient Line ship built after World War II. A sister ship to Orcades, she was named after one of many islands called Oronsay on the west coast of Scotland. The liner was completed in 1951 at Vickers-Armstrongs, Barrow-in-Furness; but several months behind schedule due to a serious fire while in the fitting-out berth. The Oronsay operated the UK to Australasia service, via the Suez Canal. Her accommodation set new standards, in both first and tourist class, with decor by Brian O'Rourke. DESCRIPTION -- Dating from the 1960's this is a silver-plated ashtray from the orient Line vessel the SS Orcades. It shows in the centre the company houseflag and vessels name and is in a very good condition. HISTORY -- The SS Orcades was the first Orient Line post-war new ship built, replacing the 1937 built Orcades which was lost in the war. Orcades was transferred to P&O Line ownership in 1962, later losing her distinctive yellow hull. She was sold for scrap in 1973. DESCRIPTION -- An as used on board item from the Orient Line. It is a dinner serving silver plated oval dish and shows on it the company marking. Very good condition and the size is 8" (20cm) x 6" (15cm) and dating from the 1960's (click on the picture to see a close up of the company logo). DESCRIPTION -- From the Orient Line shipping company this is a long service pin badge which is an early style badge and dates from the 1960's and is in a good condition. 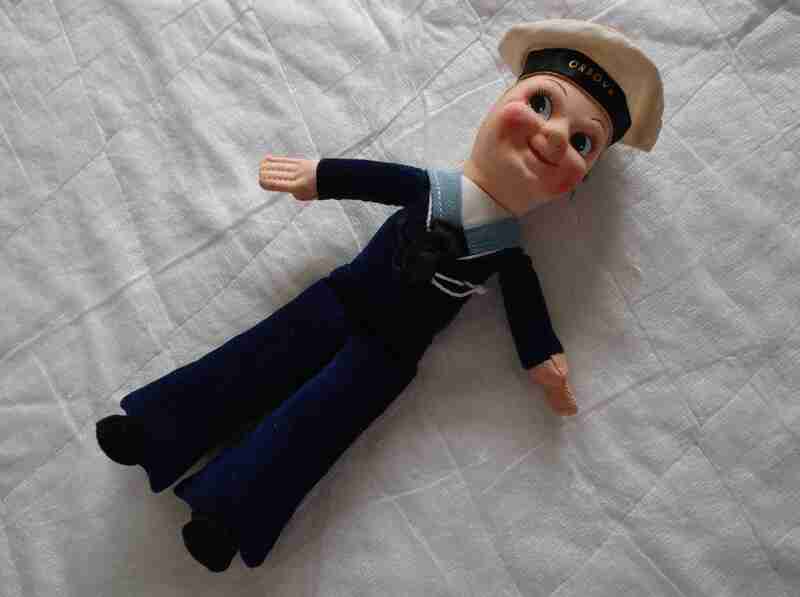 DESCRIPTION -- Rare and mint condition from the 1960's this is a sailor doll souvenir from the Orient Line vessel the SS Orsova. The size of this doll is 8" (20cm) and is in an immaculate as new condition and this type of item is not often found for sale as good as this. HISTORY -- SS Orsova, a 1503-passenger ocean liner, was built by Vickers Armstrong Shipbuilders Ltd. of Barrow-in-Furness, England, in 1954 for the Orient Steam Navigation Company for UK to Australia services via the Suez Canal, the voyage taking four weeks. After 1955, the return trip was eastward via Auckland, Suva, Honolulu, Vancouver, San Francisco, Los Angeles, Panama, Trinidad and Cherbourg. 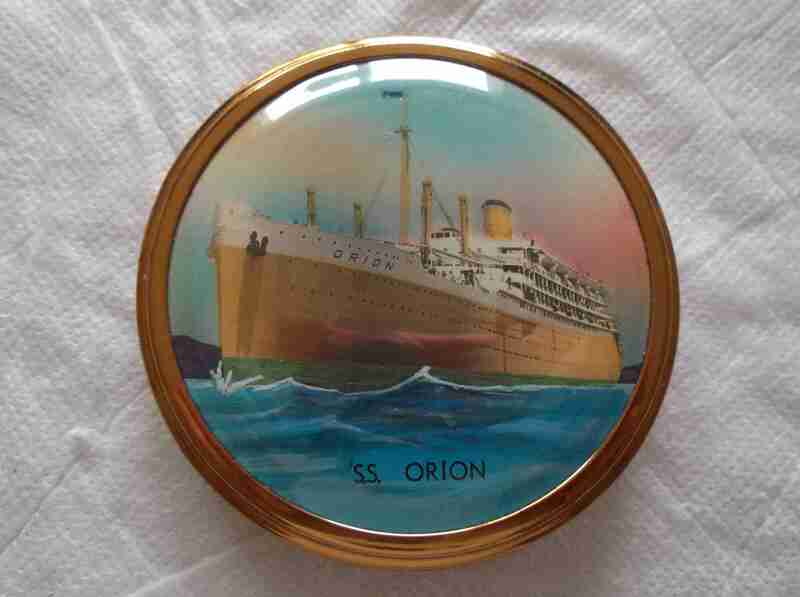 DESCRIPTION -- Great item to have found which is a ladies compact souvenir from the SS Orion of the Orient Line. It is unused and as new and protected in a presentation bag and dates from the 1950's. It shows on it a view of the vessel and the name and really is a fabulous item which would have been given to the ladies in First Class during a voyage (click on the picture for a closer view of the item). <p>HISTORY -- RMS Orion (later the SS Orion) is still considered to be one of the most famous ships on the Australian immigrant run, as she introduced a new standard in ocean travel. Orion was the first British liner with air conditioning in all her public rooms. Built by Vickers-Armstrong in Barrow, Furness, England, she was launched on December 7, 1934 and completed in August 1935. 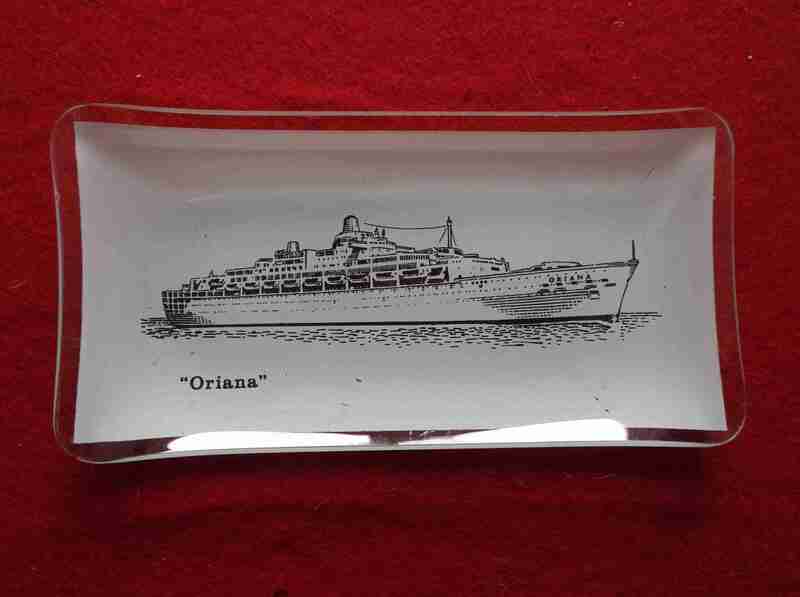 DESCRIPTION -- Dating from the 1950's this is an early souvenir from the Orient/P&O Line vessel the SS Oriana. It is an oblong glass dish and shows on it a picture of the vessel and name and the size is 6Ãƒâ€šÃ‚Â½" (16.5cm) x 3" (8.5cm) and it is in an excellent condition. <p>HISTORY -- In May 1954 the Orient Steam Navigation Company began considering replacing SS Orontes and RMS Orion on the United Kingdom to Australia route. One ship was called for, named Orbustusin the early stages of planning, before Oriana was settled on - a reference to both the former Elizabeth I of England (who was nicknamed Oriana) and the recently crowned Queen Elizabeth II. The vessel was later to be run under the banner of the P&O Line. DESCRIPTION -- Ship's stewards uniform badge from the Orient Line shipping company which is in a very good condition. 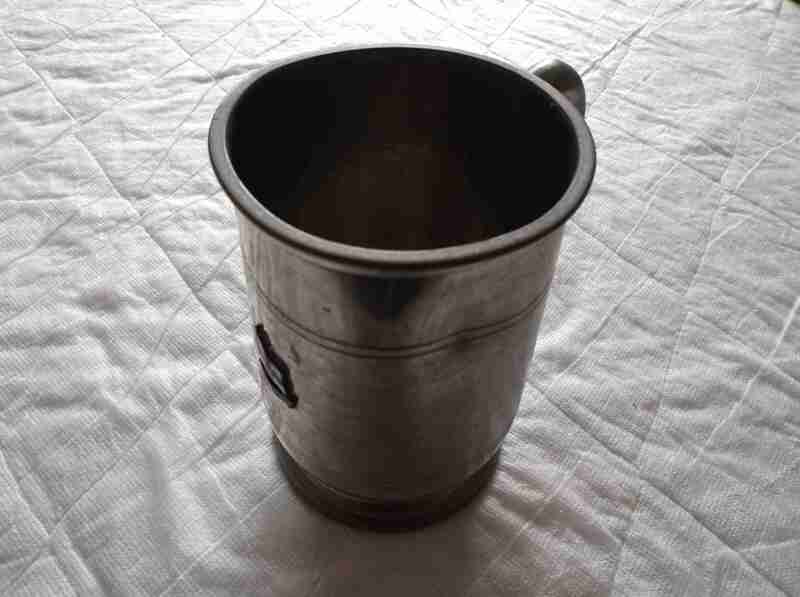 DESCRIPTION -- From the ship SS Oriana of the Orient Line this is a pewter tankard which stands 5" (12.5cm) high and is dated circa 1960's. It shows on the front the company houseflag and name and unfortunately has a very slight dent to side. HISTORY -- SS Oriana was the last of the Orient Steam Navigation Company's ocean liners. She was built at Vickers-Armstrongs, Barrow-in-Furness, Cumbria, England and launched on 3 November 1959 by Princess Alexandra. Originally resplendent with her owners' traditional corn coloured hull, Oriana appeared as an Orient Line ship until 1966, when that company was fully absorbed into the P&O group. DESCRIPTION -- Fantastic find which is an as used on board coffee pot from the Orient Line shipping company. It is produced in the traditional sea shell design and dates from the 1960's. The size of the coffee pot is 8" (20cm) high and is bottom marked by makers for the Orient Line. 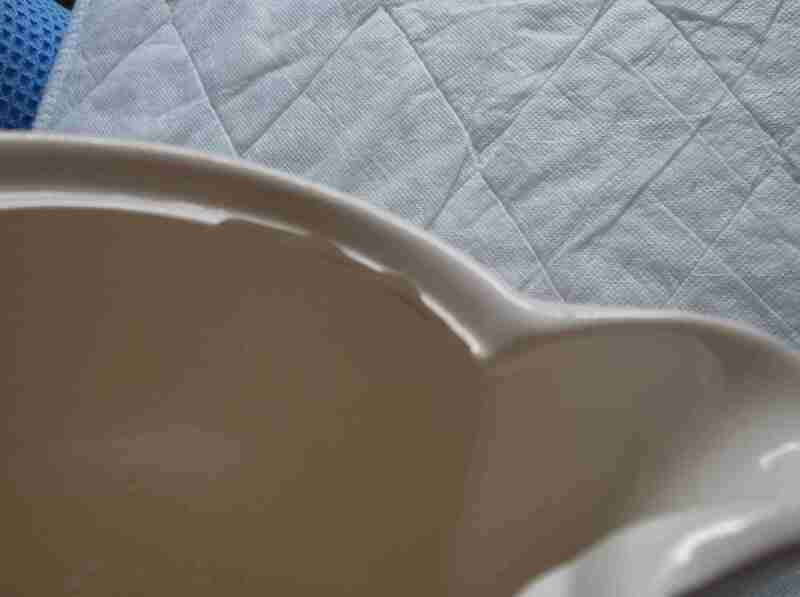 It has very slight damage to the inside top (not seen from outside) as shown if you click on the picture.